Vintage 50's Mexican Tecate beer tray. 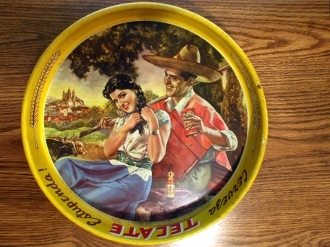 This is a vintage 50's Mexican Tecate beer tray,it's an uncommon one. Shows wear, having rust & scratches. The color is faint, which appears to have been manufactured this way. I have not seen any with crisp, vibrant color. Nice tray for it's age. Tray reads "Cerveza Tecate Estupenda!" Back reads "Gran Cerveza Tecate". Also marked REGS. S.S.A. NO 19097 "A". 13" diameter & 1 3/4" dip.